Surfer Girl Has Spoken. Again. 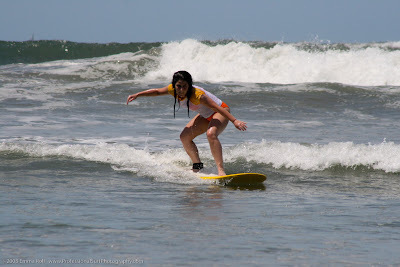 Surfer girl Shira has responded to our response of a post with “I’ve been using the body butter every day (LOVE IT)” as well as giving us the link to the surf camp her friend Annie owns in Costa Rica. We noticed a fun MySpace page as well. Though spring is here, it isn’t consistently balmy, to say the least. We could all use a gaze at Split Peaks Surf Adventures. Surfer girl said photos don’t even do it justice, but we can feel the ocean breeze just by looking…ahhhh. Wouldn’t this be a great place for a company meeting? Forget bonding over ‘trust excercises’ – go boarding instead! Heeeellllooooooo…cool girl with the cool connections…we will humbly go where no spa products have gone before. Get us the hookup! And though Dad knew the guy who wrote the original Surfer’s Dictionary, I sadly had to look up ‘charging pipe’. Hey, the closest we get to courduroy is that bad 70s fashion sense and one, enormous lake. My roots are also Nor Cal (shout out Goat Rock! ), which waters lend better to wetsuits, abalone, and sore necks twisting on alert for sharks and rangers. But looking at your photo, I feel a little jealous. Seriously, let’s talk. What a way to enter Friday. Syd sent these images of a story he’s just completed – beautiful, seemingly 40’s inspired images, just now to share. The clothes! The lighting! The elements! The hair! Did we mention the hair? !